2 WAYNE M. McKIBBEN 2 DOCKET NO. 1,034,394 his request for medical treatment. Presumably, respondent would argue that the ALJ s order denying benefits should be affirmed. The issues for the Board s review are: (1 Did claimant provide respondent with timely notice of his work-related accident? (2 Does the Board have jurisdiction of claimant s appeal of the denial of his request for medical treatment? If so, did claimant sustain his burden of proving that he is entitled to medical treatment for his work-related injury paid by respondent? FINDINGS OF FACT Sometime in January 2007, claimant was working on a job site for respondent. He and some coworkers were tearing down the equipment, because the job had ended. Claimant lost his footing in the mud while carrying a hydraulic ram that weighed over 250 pounds. He did not fall, but felt pain in his right knee. He told Lowell Hickman that his knee was hurting within an hour of it occurring. He did not describe the incident or say that the pain was the result of a work-related accident. Mr. Hickman, who was the assistant to 1 the superintendent, said, "What now?". Claimant did not think anymore about it and continued working. Later that evening, after claimant had returned home from work, his right knee began to swell around the back and he felt pain going from the side of the knee shooting around the back. Thereafter, claimant continued working for respondent. He complained to some of his coworkers about his knee, but he did not complain to management or request medical treatment. On February 21, 2007, claimant went on his own to see Dr. Rolando Mesina for treatment of his right knee problems. An x-ray was taken of claimant s right knee, and an MRI was ordered. Dr. Mesina gave him an injection in his knee and gave him a slip restricting him to light duty beginning February 22. Claimant testified that he took the lightduty slip back to respondent and was placed on light duty. Claimant followed up with Dr. Mesina on February 28 and was again given a slip restricting him to light duty work. Dr. Mesina also referred claimant to an orthopedic surgeon, but the orthopedic surgeon refused to treat claimant because it was determined that claimant s injury was work related. 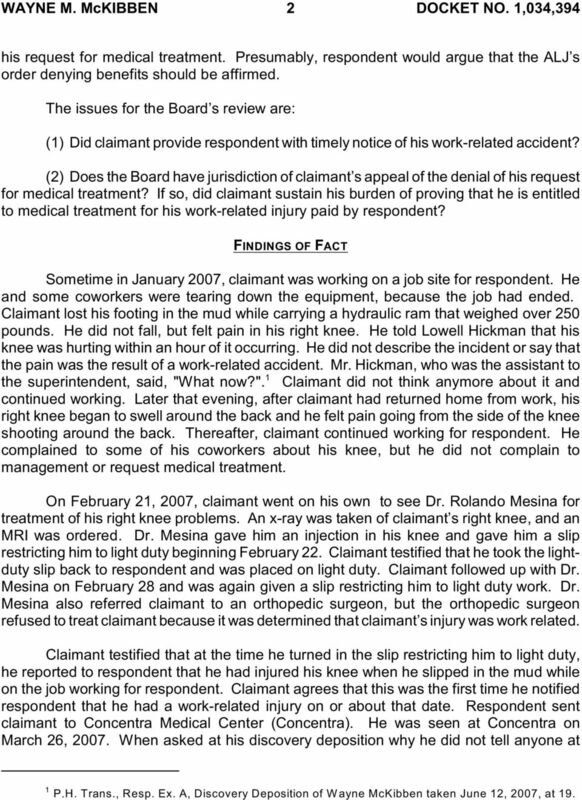 Claimant testified that at the time he turned in the slip restricting him to light duty, he reported to respondent that he had injured his knee when he slipped in the mud while on the job working for respondent. Claimant agrees that this was the first time he notified respondent that he had a work-related injury on or about that date. Respondent sent claimant to Concentra Medical Center (Concentra. He was seen at Concentra on March 26, When asked at his discovery deposition why he did not tell anyone at 1 P.H. Trans., Resp. Ex. 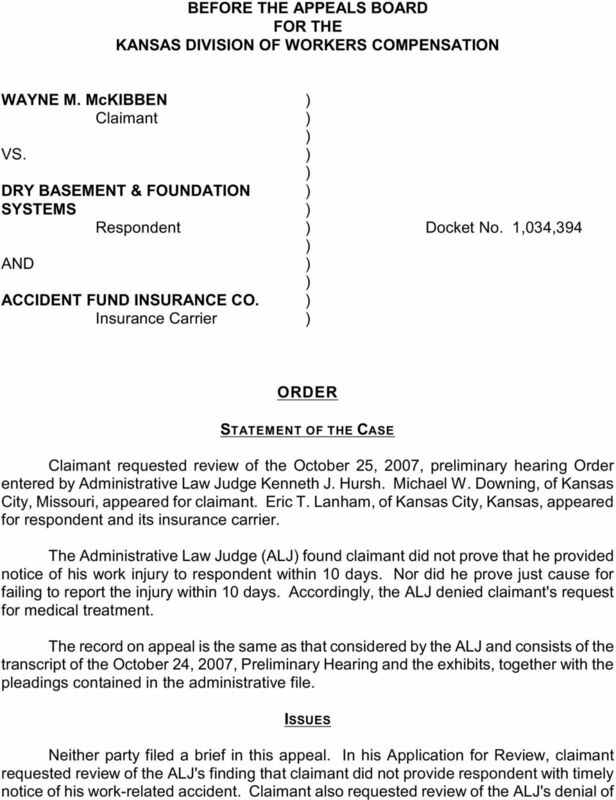 A, Discovery Deposition of W ayne McKibben taken June 12, 2007, at 19. 3 WAYNE M. McKIBBEN 3 DOCKET NO. 1,034,394 work about the accident sooner, he replied that he did not think the injury was that big of a deal. The medical records of Concentra indicate that claimant reported a date of accident of January 7, He told Concentra that he told respondent of the symptoms "early 2 on." He testified in his discovery deposition that the January 7 date of accident was wrong and that he was just guessing at a date when he was seen at Concentra. He knows he was injured on either a Thursday or a Friday and that it was the last day respondent worked at that particular job site. He believes he was injured on or about January 25, Claimant no longer works for respondent. His last day of work for claimant was May 11, He testified that because he was placed on light duty, he was unable to work the number of hours he had worked previously. As a result of earning less money, he lost his house and had to move in with his wife's family, who live near the Lake of the Ozarks. PRINCIPLES OF LAW The Board s jurisdiction to review a preliminary hearing order is limited. K.S.A Supp (i(2(A states in part: If an administrative law judge has entered a preliminary award under K.S.A a and amendments thereto, a review by the board shall not be conducted under this section unless it is alleged that the administrative law judge exceeded the administrative law judge's jurisdiction in granting or denying the relief requested at the preliminary hearing. K.S.A a(a(2 states in part: Upon a preliminary finding that the injury to the employee is compensable and in accordance with the facts presented at such preliminary hearing, the administrative law judge may make a preliminary award of medical compensation and temporary total disability compensation to be in effect pending the conclusion of a full hearing on the claim, except that if the employee's entitlement to medical compensation or temporary total disability compensation is disputed or there is a dispute as to the compensability of the claim, no preliminary award of benefits shall be entered without giving the employer the opportunity to present evidence, including testimony, on the disputed issues. A finding with regard to a disputed issue of 2 3 P.H. Trans., Cl. Ex. 2 at 2. 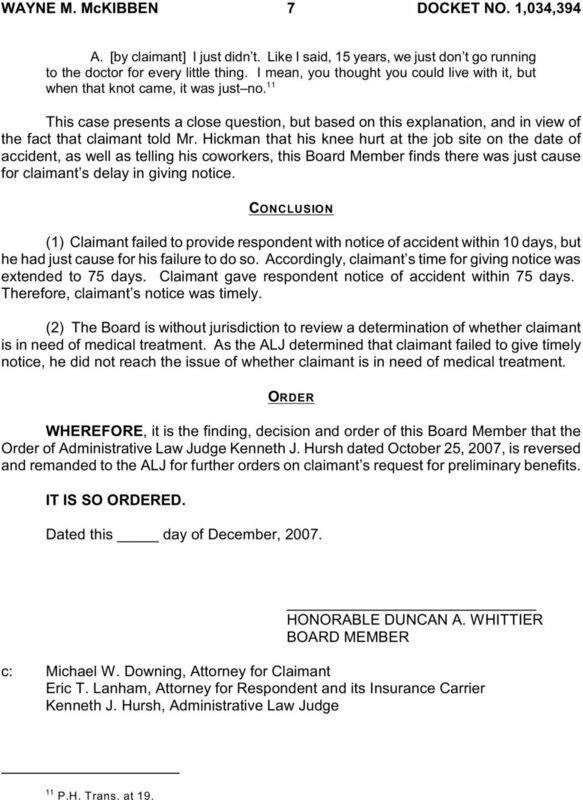 The ALJ s Order of October 25, 2007, indicates that claim ant testified he was injured on approxim ately January 27. However, a review of the record does not reveal that January 27 was ever mentioned as a possible date of accident. 4 WAYNE M. McKIBBEN 4 DOCKET NO. 1,034,394 whether the employee suffered an accidental injury, whether the injury arose out of and in the course of the employee's employment, whether notice is given or claim timely made, or whether certain defenses apply, shall be considered jurisdictional, and subject to review by the board... Except as provided in this section, no such preliminary findings or preliminary awards shall be appealable by any party to the proceedings, and the same shall not be binding in a full hearing on the claim, but shall be subject to a full presentation of the facts. 4 In Allen, the Kansas Court of Appeals stated: Jurisdiction is defined as the power of a court to hear and decide a matter. The test of jurisdiction is not a correct decision but a right to enter upon inquiry and make a decision. Jurisdiction is not limited to the power to decide a case rightly, but includes the power to decide it wrongly. When the record reveals a lack of jurisdiction, the Board's authority extends no 5 further than to dismiss the action. K.S.A states: Except as otherwise provided in this section, proceedings for compensation under the workers compensation act shall not be maintainable unless notice of the accident, stating the time and place and particulars thereof, and the name and address of the person injured, is given to the employer within 10 days after the date of the accident, except that actual knowledge of the accident by the employer or the employer's duly authorized agent shall render the giving of such notice unnecessary. The ten-day notice provided in this section shall not bar any proceeding for compensation under the workers compensation act if the claimant shows that a failure to notify under this section was due to just cause, except that in no event shall such a proceeding for compensation be maintained unless the notice required by this section is given to the employer within 75 days after the date of the accident unless (a actual knowledge of the accident by the employer or the employer's duly authorized agent renders the giving of such notice unnecessary as provided in this section, (b the employer was unavailable to receive such notice as provided in this section, or (c the employee was physically unable to give such notice. K.S.A provides that notice may be extended to 75 days from the date of accident if claimant s failure to notify respondent under the statute was due to just cause. Although not an exhaustive list, the Board has listed several factors which may be considered when determining whether just cause exists: 4 Allen v. Craig, 1 Kan. App. 2d 301, , 564 P.2d 552, rev. denied 221 Kan. 757 ( See State v. Rios, 19 Kan. App. 2d 350, Syl. 1, 869 P.2d 755 (1994. 5 WAYNE M. McKIBBEN 5 DOCKET NO. 1,034,394 (1 The nature of the accident, including whether the accident occurred as a single, traumatic event or developed gradually. (2 Whether the employee is aware he or she has sustained an accident or an injury on the job. (3 The nature and history of claimant s symptoms. 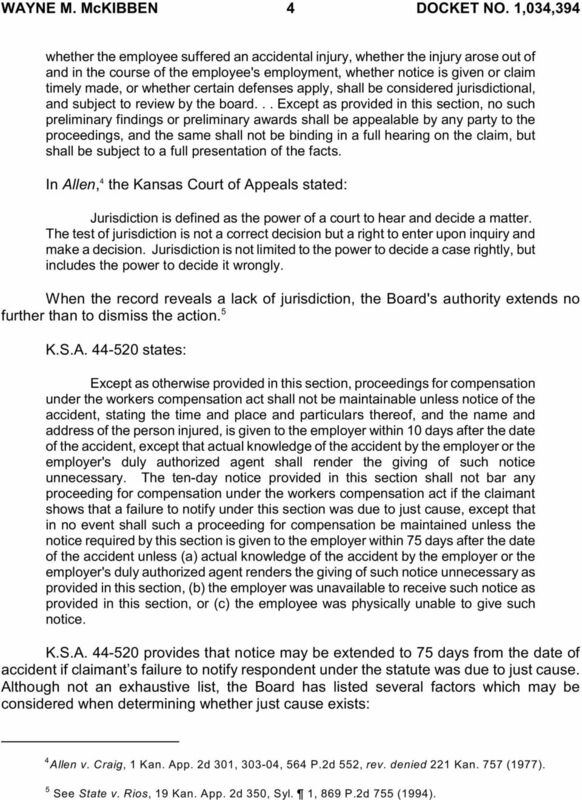 (4 Whether the employee is aware or should be aware of the requirements of reporting a work-related accident and whether the respondent had posted notice as required by K.A.R By statute, preliminary hearing findings and conclusions are neither final nor binding 7 as they may be modified upon a full hearing of the claim. Moreover, this review of a preliminary hearing order has been determined by only one Board Member, as permitted by K.S.A Supp (i(2(A, as opposed to being determined by the entire Board as it is when the appeal is from a final order. 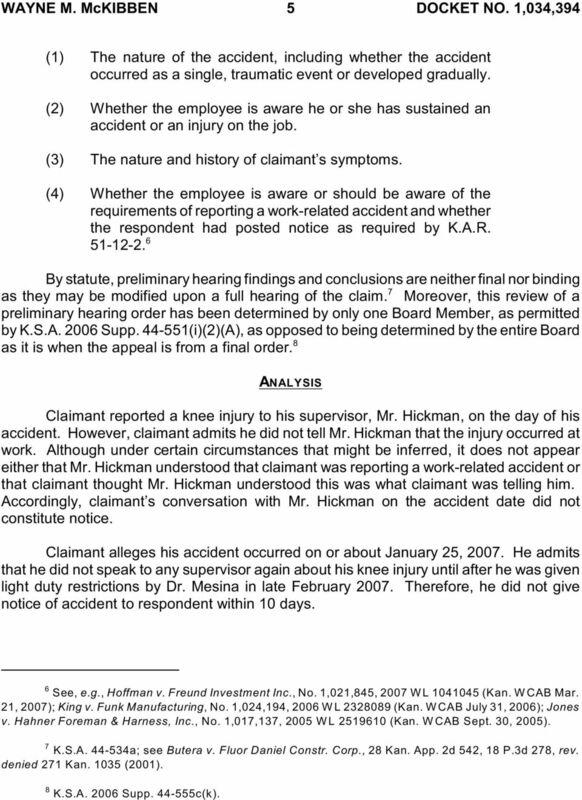 8 ANALYSIS Claimant reported a knee injury to his supervisor, Mr. Hickman, on the day of his accident. 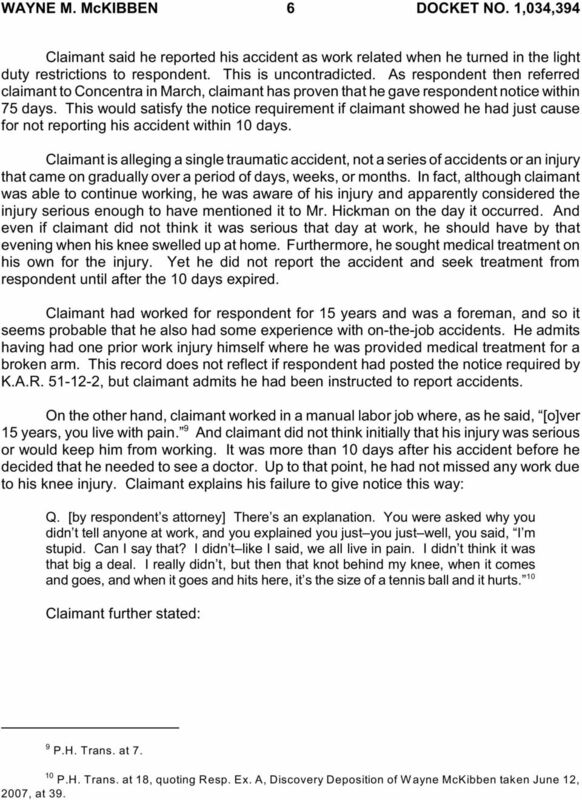 However, claimant admits he did not tell Mr. Hickman that the injury occurred at work. Although under certain circumstances that might be inferred, it does not appear either that Mr. Hickman understood that claimant was reporting a work-related accident or that claimant thought Mr. Hickman understood this was what claimant was telling him. Accordingly, claimant s conversation with Mr. Hickman on the accident date did not constitute notice. Claimant alleges his accident occurred on or about January 25, He admits that he did not speak to any supervisor again about his knee injury until after he was given light duty restrictions by Dr. Mesina in late February Therefore, he did not give notice of accident to respondent within 10 days. 6 See, e.g., Hoffman v. Freund Investment Inc., No. 1,021,845, 2007 W L (Kan. W CAB Mar. 21, 2007; King v. Funk Manufacturing, No. 1,024,194, 2006 W L (Kan. W CAB July 31, 2006; Jones v. Hahner Foreman & Harness, Inc., No. 1,017,137, 2005 W L (Kan. W CAB Sept. 30, K.S.A a; see Butera v. Fluor Daniel Constr. Corp., 28 Kan. App. 2d 542, 18 P.3d 278, rev. denied 271 Kan ( K.S.A Supp c(k.
6 WAYNE M. McKIBBEN 6 DOCKET NO. 1,034,394 Claimant said he reported his accident as work related when he turned in the light duty restrictions to respondent. This is uncontradicted. As respondent then referred claimant to Concentra in March, claimant has proven that he gave respondent notice within 75 days. This would satisfy the notice requirement if claimant showed he had just cause for not reporting his accident within 10 days. Claimant is alleging a single traumatic accident, not a series of accidents or an injury that came on gradually over a period of days, weeks, or months. In fact, although claimant was able to continue working, he was aware of his injury and apparently considered the injury serious enough to have mentioned it to Mr. Hickman on the day it occurred. And even if claimant did not think it was serious that day at work, he should have by that evening when his knee swelled up at home. Furthermore, he sought medical treatment on his own for the injury. Yet he did not report the accident and seek treatment from respondent until after the 10 days expired. Claimant had worked for respondent for 15 years and was a foreman, and so it seems probable that he also had some experience with on-the-job accidents. He admits having had one prior work injury himself where he was provided medical treatment for a broken arm. This record does not reflect if respondent had posted the notice required by K.A.R , but claimant admits he had been instructed to report accidents. On the other hand, claimant worked in a manual labor job where, as he said, [o]ver 9 15 years, you live with pain. And claimant did not think initially that his injury was serious or would keep him from working. It was more than 10 days after his accident before he decided that he needed to see a doctor. Up to that point, he had not missed any work due to his knee injury. Claimant explains his failure to give notice this way: Q. [by respondent s attorney] There s an explanation. You were asked why you didn t tell anyone at work, and you explained you just you just well, you said, I m stupid. Can I say that? I didn t like I said, we all live in pain. I didn t think it was that big a deal. I really didn t, but then that knot behind my knee, when it comes and goes, and when it goes and hits here, it s the size of a tennis ball and it hurts. 10 Claimant further stated: 9 10 P.H. Trans. at 7. P.H. Trans. at 18, quoting Resp. Ex. A, Discovery Deposition of W ayne McKibben taken June 12, 2007, at 39. 7 WAYNE M. McKIBBEN 7 DOCKET NO. 1,034,394 A. [by claimant] I just didn t. Like I said, 15 years, we just don t go running to the doctor for every little thing. I mean, you thought you could live with it, but when that knot came, it was just no. 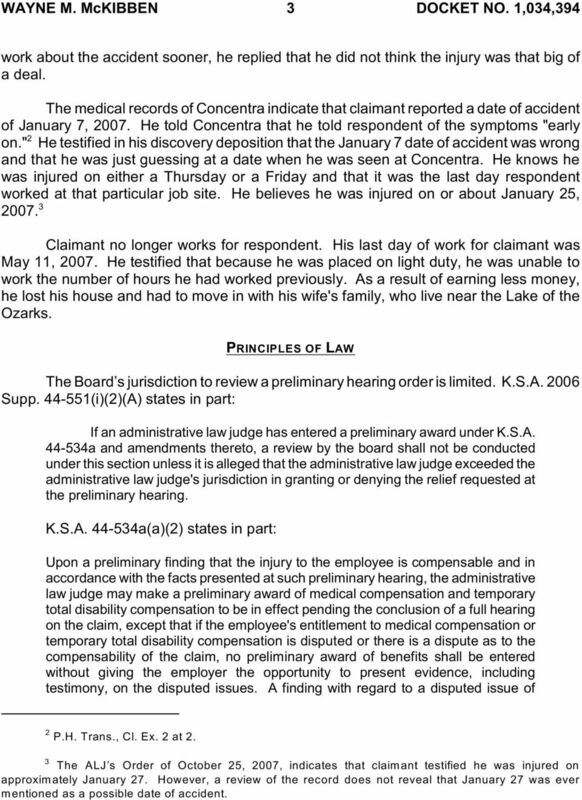 11 This case presents a close question, but based on this explanation, and in view of the fact that claimant told Mr. Hickman that his knee hurt at the job site on the date of accident, as well as telling his coworkers, this Board Member finds there was just cause for claimant s delay in giving notice. CONCLUSION (1 Claimant failed to provide respondent with notice of accident within 10 days, but he had just cause for his failure to do so. Accordingly, claimant s time for giving notice was extended to 75 days. Claimant gave respondent notice of accident within 75 days. Therefore, claimant s notice was timely. (2 The Board is without jurisdiction to review a determination of whether claimant is in need of medical treatment. As the ALJ determined that claimant failed to give timely notice, he did not reach the issue of whether claimant is in need of medical treatment. ORDER WHEREFORE, it is the finding, decision and order of this Board Member that the Order of Administrative Law Judge Kenneth J. Hursh dated October 25, 2007, is reversed and remanded to the ALJ for further orders on claimant s request for preliminary benefits. IT IS SO ORDERED. Dated this day of December, HONORABLE DUNCAN A. WHITTIER BOARD MEMBER c: Michael W. Downing, Attorney for Claimant Eric T. Lanham, Attorney for Respondent and its Insurance Carrier Kenneth J. Hursh, Administrative Law Judge 11 P.H. Trans. at 19. STATE OF LOUISIANA COURT OF APPEAL, THIRD CIRCUIT 11-94 DANIELLE C. GARRICK VERSUS WAL-MART STORES, INC., ET AL. ********** APPEAL FROM THE OFFICE OF WORKERS COMPENSATION - # 3 PARISH OF CALCASIEU, NO.